"Lindell looked at him and felt a sudden tenderness. She saw that his beard had more grey hairs and the pain in his back had made his posture stooped. He was the best chief she had ever had, but sometimes it was as if he didn't have the energy anymore. Evil was exhausting him." THE PRINCESS OF BURUNDI is a book containing two stories. One is the story of a crime, in which an unemployed welder is killed in a cruel manner, leaving a wife and son to struggle on without him. Who could have killed him, and why? The second story is that of the Uppsala police force, a close-knit group who know and understand, or tolerate, each other's differences in the common goal of righting wrong. As other reviewers have pointed out, THE PRINCESS OF BURUNDI is a conscious homage to Ed McBain's 87th Precinct novels. Almost exactly mid-way through the book, a Rastafarian locksmith asks the policeman who has asked him to open the door of a deserted apartment: "Are you Sweden's answer to Carella?" The policeman doesn't understand the question (but nods anyway); nor does the reader have to, but if you have read McBain, or Peter Turnbull's excellent Glasgow P-division novels, or watched the TV series Hill St Blues, you will be in familiar territory. A thorough investigation with no one hero, no question left unexplored in the attempt to understand the community in which the crime took place, in the knowledge that in the slow process of gathering little pieces of information, however apparently irrelevant, answers will inevitably emerge. The murdered man was locally famous for his aquarium, a time-consuming hobby in which he carefully tended and kept cichlid fish, originally from African lakes. But how could he afford it? And what was the dream that was somehow connected with it? It also emerges that he was a keen poker player, and there are rumours of a big win. Big enough to lead to his death? 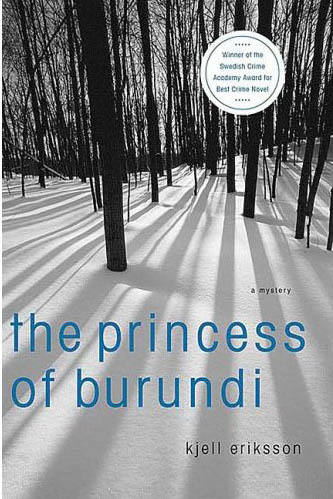 One question is the mysterious title of the book, and the identity of the Princess of Burundi. We are first told something about her on page 126 (St Martin's Minotaur paperback edition), but we don't find out exactly who she is until quite a bit later on, nor do we know her significance until near the end. This book comes very highly recommended by many reviewers, and is a winner of the Swedish Crime Academy award for "best crime novel". I found it rather hard to get into, however, and was almost at the point of giving up until about a third of the way in, when everything began to gel. In the first third, there are too many threads: none of the police characters features sufficiently to become fixed in the mind, and the early introduction of the obligatory obsessive, unhinged loner is a distraction from the set-up of the murder and the reader's interest in finding out more about the dead man's family and life. However, when detectives Ola Haver and Ann Liddell begin to feature more, both professionally and personally, things becomes much more absorbing. They, and some of the other police officers, gradually come to life on the page. And as the book unfolds, the insights into the local Swedish community and the changes that have occurred over the previous 30 years or so are fascinating. In the end, after all the build-up, the solution to the mystery is a let-down, particularly as it involved the introduction of a new character in the final pages. But I was sold on the book by then, and look forward to reading more about the Uppsala detectives and the crimes they will no doubt solve in future, as well as finding out more about their personal lives as they work to keep the peace on those mean, snowy streets. Read another review of THE PRINCESS OF BURUNDI.